Old Oak Park Road resident Natalie Beller thinks she’s a very lucky woman to live in the canyons east of Pismo Beach. And she thinks ongoing expansion activities at Freeport McMoRan’s hub in Price Canyon have the potential to drag that vision of paradise away from her. Beller said as much during a recent Department of Oil, Gas, and Geothermal Resources (DOGGR) hearing in San Luis Obispo on Sept. 21. 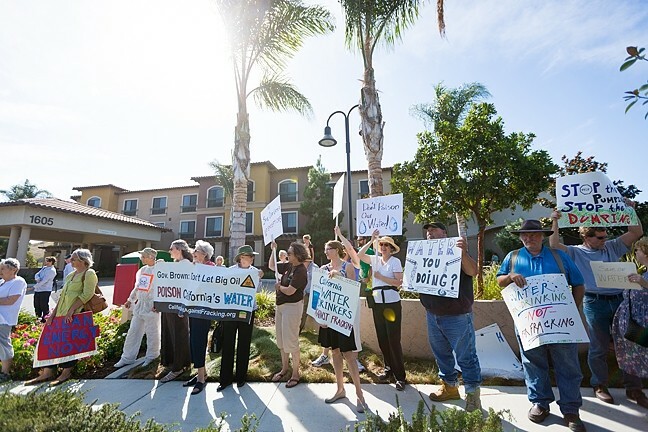 MAD ABOUT WATER: Demonstrators showed up at a Sept. 21 DOGGR hearing to protest approval of a Freeport McMoRan application to exempt a local aquifer from the Safe Drinking Water Act. She’s worried about oil spills and brine spills, earthquakes and cross-contamination of aquifers, and a planned oil drilling expansion project she said is hard to understand the full breadth of. That opinion is shared by several residents who live in and around the Price Canyon/Old Oak Canyon area and is spurred by a combination of things: An oil pipeline that’s being installed from Freeport McMoRan’s site to the Phillip’s 66 pipeline, a proposed 450 oil well drilling expansion project, and an application to exempt a larger portion of the aquifer within the Arroyo Grande oil field from the Safe Drinking Water Act. The recent DOGGR hearing in SLO covered the last thing on the list: expanding the aquifer exemption. Freeport McMoRan put in the application earlier this year, and thus far both DOGGR and the Central Coast Regional Water Quality Control Board are recommending approval of the application. The U.S. Environmental Protection Agency has final say in the matter. An exemption means that injection of water for oil extraction purposes and re-injection of produced water leftover from drilling operations would be allowed in the aquifer. In 2014, the California Department of Conservation, which oversees DOGGR, discovered that thousands of injection/re-injection wells it permitted were actually being drilled into “non-exempt” aquifers—aquifers covered under the Safe Drinking Water Act, basically water that’s considered potable, drinkable, and usable by humans. Included on a list of 50,000 wells in California that needed to be reviewed were between 70 and 80 wells run by Freeport McMoRan on the Arroyo Grande oil field, according to a list on the Department of Conservation’s website. In an email to New Times, state Oil and Gas Supervisor Steve Bohlen said that while Freeport McMoRan’s Arroyo Grande oil field wells were improperly permitted due to the aquifer’s non-exempt status, none of them made the list of 23 wells that were shut down due to concerns about groundwater contamination. The recent application contends that the aquifer/formation—the Dollie Sands, Pismo Formation, Arroyo Grande Field—is an oil-bearing zone that isn’t and will never be used for human consumption. Bohlen said that roughly 30 to 40 oil-bearing formations around the state are being investigated as potentials for the same exemption Freeport McMoRan is applying for. The Midway Sunset field, which lies mostly in Kern County but extends into SLO County, is also one of those formations. DOGGR, Freeport McMoRan, and the regional water board disagree with her assessment, but that’s not the only concern with the application, according to Golden-Krasner. More pressing is a worry that local residents’ wells could be contaminated with that undrinkable water, she said. Although the application contends that boundaries separating underground water basins in the area are essentially impermeable, Golden-Krasner argues that there’s nothing included in the application about earthquakes and their potential to cause fissures that change the way water is stored and moves under ground. Old Oak Canyon resident Beller said that perceptions of what’s possible and impossible change all the time, and it’s often caused by an accident nobody thought could happen. She added that 3rd District Supervisor Adam Hill spoke at the hearing and questioned why local public officials hadn’t been notified about the application/hearing. Hill told New Times that the county’s been following the issue, but wasn’t actually notified by the Department of Conservation, adding that his issues with not being notified have a lot to do with public distrust of DOGGR over its ability to do its job—put public health concerns first and the needs of oil companies second.